A great thing about this personal search of mine is the interesting new stuff I come across. 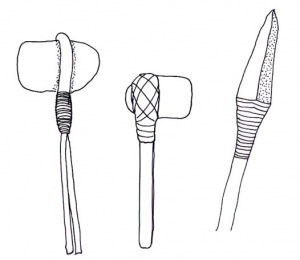 Who knew fabric would bring out new word on our hominid ancestors… Of course this blog is about rugs, carpets and tapestries, not hafting, which is defined as the securing of a handle to an axe, knife or spear. But rugs and hafts share a common history in that both required a craftsman with the ability to produce and manipulate fabric. Up until recently it was impossible for paleontologists to find evidence of hafting in the far distant past. 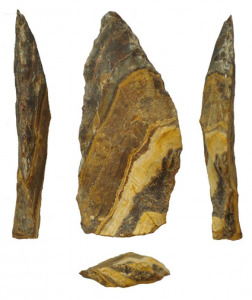 The oldest fabric ever found was a piece of white linen wrapped around a tool made from an antler in Turkey; it was about 9000 years old, many millenia after the Neanderthals had disappeared. (The oldest knotted rug is only 2500 years old) This lack of any older evidence of fabric manipulation led paleontologists to believe that those older hominids lacked the ability to increase the killing distance and power of their weapons by combining sharp flint stones and sticks. and the new scientific tools. 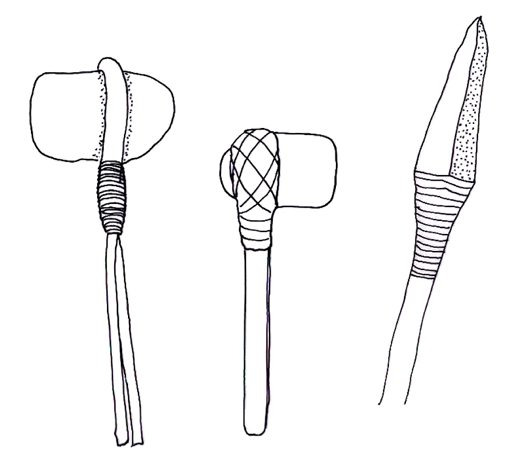 Apparently these later, better run studies discovered crude needles and fabric imprints on clay statutes as far back as 26,000 years ago by modern man; and at Dzudzuana Cave in the Republic of Georgia, fashion even reared its head as 30,000 year old spun plant fibres were found which had been dyed in several colors like pink, black and turquoise blue–again by our direct ancestors, Cro Magnon man. 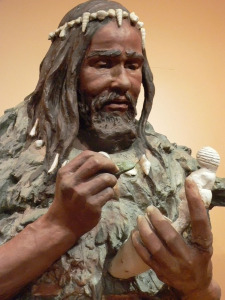 But as it turns out, the ability to manipulate natural fibers didn’t start with the cro-magnon. 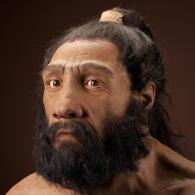 Our predecessors in humanness, the Neanderthals had long been thought too stupid to use fabric in any way other than to cover themselves with animal skins (which I would have thought begged the question, how did they keep the skins tied together?). Even their weapons were thought to be nothing but sharp, hand-held rocks and long sharp sticks; which left them kill their prey by cornering it and ramming with the sticks and cutting with the hand-held rocks–a damn dangerous business considering the size of the animals that wandered Europe during that day. 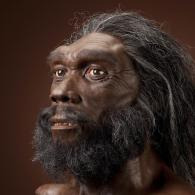 Homo Neanderthalis… I have coffee with uglier guys by far than this. That takes us back to well before our ancestors made their way out of Africa 125,000 years ago. 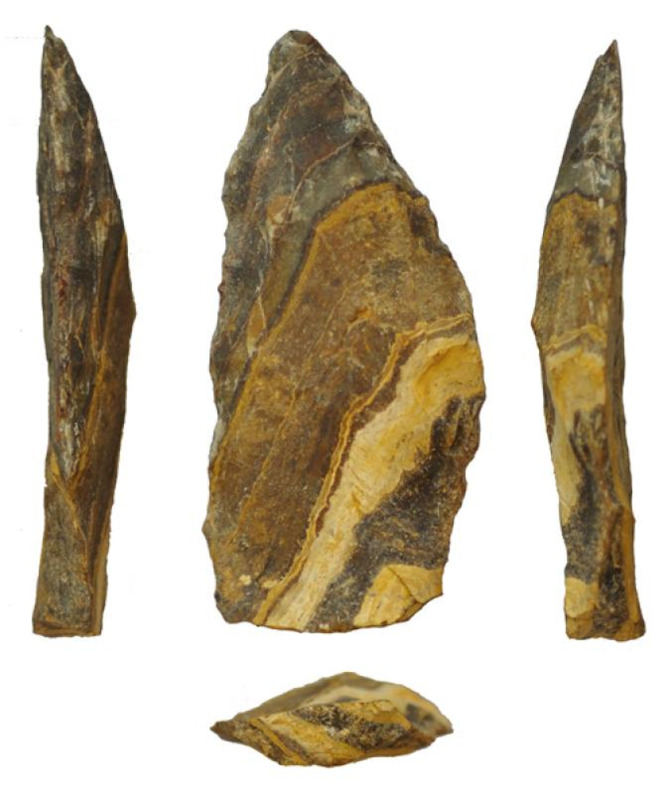 But even more amazing was a discovery made in 1995 at the Pleistocene site at Schoningen, Germany: spear points shaped and apparently hafted by an even more remote human forbearer, Homo Heidelbergensis about 400,000 years ago. A “level of weirdness…like finding an Ipod in a Roman Empire site,” according to paleoanthropologist John Shea in an article on the National Geographic website. It appears that the ability to manipulate fabric goes back at least as far as our ability to make weaponry. Homo heidelbergensis…I would not care to meet this fellow in a dark alley!